Obama and Romney on immigration: Who will deport more? 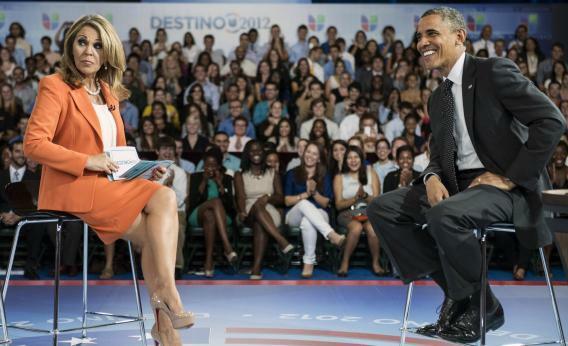 Co-host Maria Salinas and Obama at the Univision forum. “I am happy to take responsibility for being naive here,” Obama told an audience in Miami yesterday. Thus we have a long-term strategy that may inspire generations of first time presidential candidates: Promise the world and when you fail to deliver it, call yourself a hopeless idealist. No one hates a dreamer. Now, what I’ve always said is, as the head of the executive branch, there’s a limit to what I can do. Part of the reason that deportations went up was Congress put a whole lot of money into it, and when you have a lot of resources and a lot more agents involved, then there are going to be higher numbers. What we’ve said is, let’s make sure that you’re not misdirecting those resources. But we’re still going to, ultimately, have to change the laws in order to avoid some of the heartbreaking stories that you see coming up occasionally. The U.S. Immigration and Customs Enforcement agency has expelled 1.5 million immigrants during Obama’s tenure, far more than Bush managed in the same time frame. Obama claims he instructed ICE to prioritize criminals, and it’s true that some of the deported might be categorized as such. One criminal ICE went after is Juana Reyes, a mother of two charged with trespassing for the crime of selling tamales in a Walmart parking lot. She had been in the United States for 16 years before authorities arrested her for selling a cheap lunch Walmart employees reportedly enjoyed. One can always find sympathetic anecdotes—perhaps Juana is an isolated case in a rising swell of homicidal Mexicans—but the conflation of violent and non-violent criminals is too politically convenient to ignore. The list of priority deportees includes women who call the police to report assault and people with traffic violations. In light of all this, ABC News asks “Who would deport more?” and spends a thousand words telling us that no one has a clue. Obama, in his bid for sympathy, can point to his advocacy for the DREAM Act and his opposition to a discriminatory measure in Arizona. As for Romney, it depends whether you believe the Romney of primary season, who made Rick Perry sound like a bleeding heart humanitarian, or the Romney of yesterday, who told the Univision anchors, “my plan isn’t to deport people.” Perhaps if he keeps telling us what his plans aren’t, he’ll fill in so much negative space that we’ll have a detailed account of what his plans are.